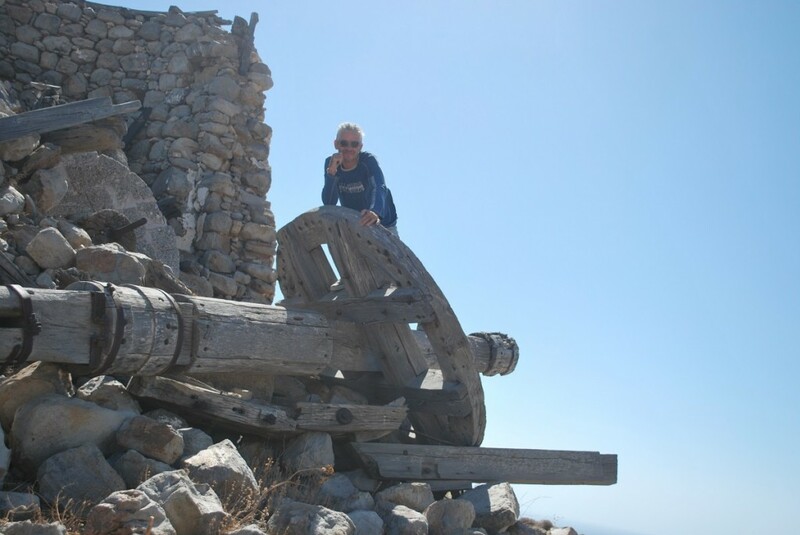 To get to this fascinating land of forgotten windmills we trekked up to Xaplovouni Hill. It was open for us to explore so we walked through the prickly overgrown dry patches of earth to look around these old abandoned windmills. They remained in various stages of disarray and none of them worked any longer. 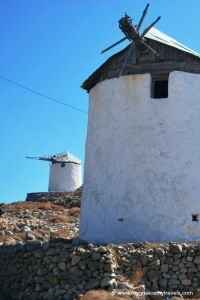 Just like other Cycladic islands, the windmills of Kimolos were key structures for agricultural production. The island chain, located in the middle of the Aegean Sea, was and continues to be in the direct path of regular strong gusts of wind that blow between 200 to 300 days a year. 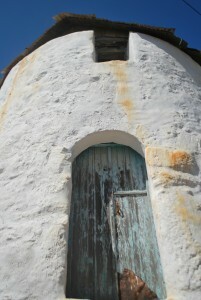 The windmills were kept up well at one point, whitewashed regularly and sometimes adorned with bright blue doors. Most of them were secured with strong, conical wooden roofs while one still had a rusty makeshift steel roof instead.That was then. 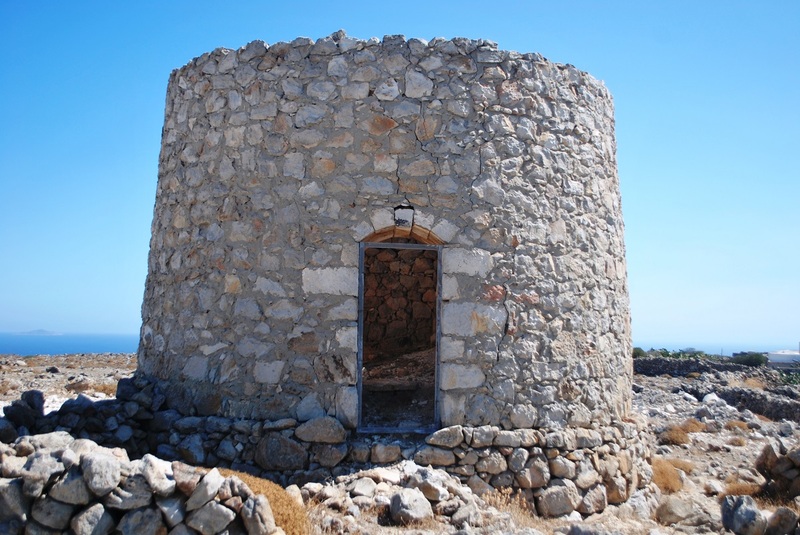 As I saw it, the hill of windmills was a crumbling example of the island’s agricultural and cultural past. Things have changed and they are no longer needed. 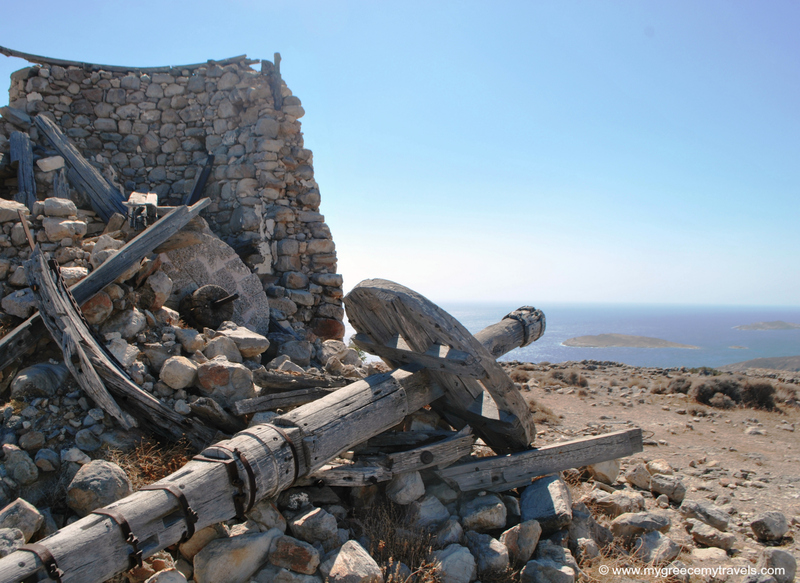 One thing must have remained the same since the windmills’ glory days: the stunning view. 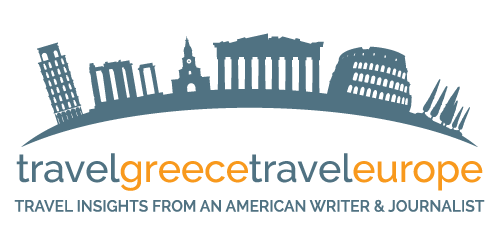 You can take a ferry from the Athens port of Piraeus to Kimolos. The journey typically lasts three to six hours depending on the speed of the boat. 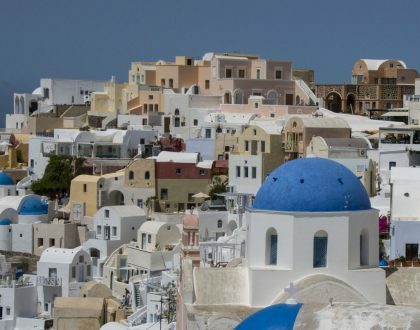 Another option is to take a flight from Athens International Airport to the neighboring island of Milos and take a short ferryboat ride from there. 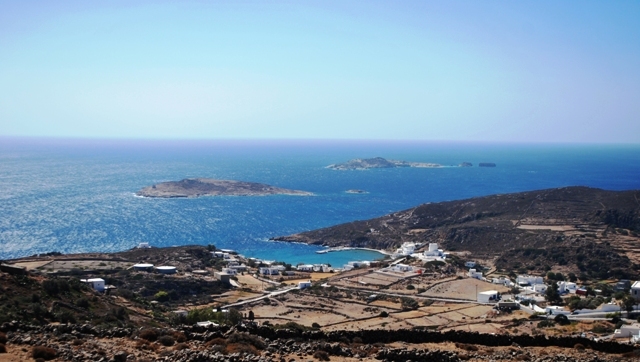 Kimolos is also connected with Paros, Santorini Greece, Serifos and other Cycladic islands. 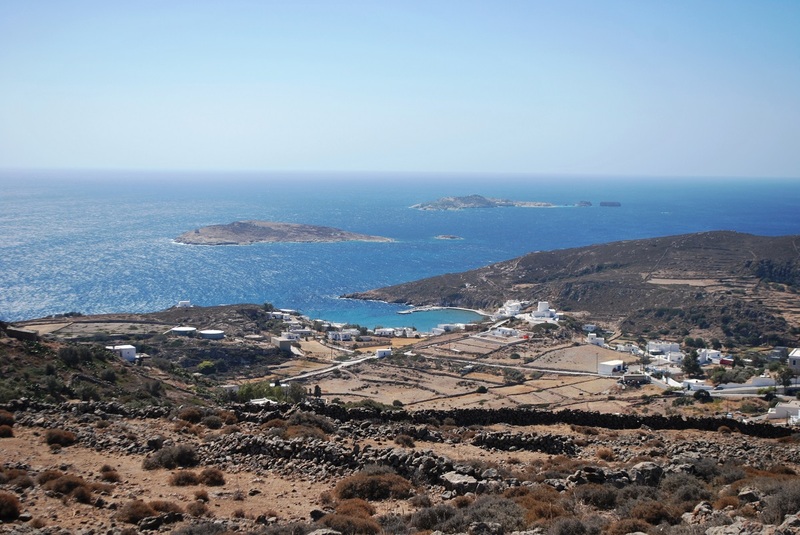 Kimolos is a fantastic island to explore, unspoiled by mass tourism. To decide where to go to the beach read up on The Best Beaches of Kimolos Island. 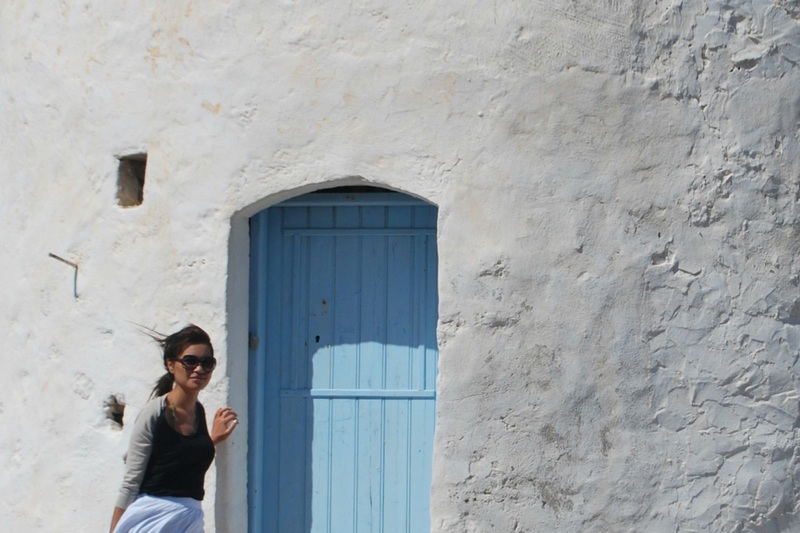 Definitely head to Goupa Village, an authentic little fishing village on the island. Kimolos has tons of white stuff: chalk. 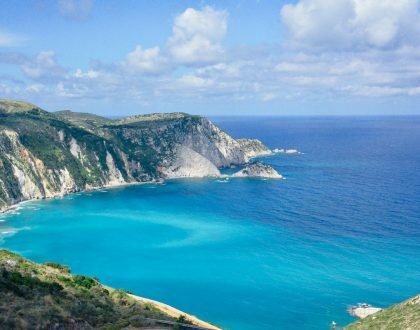 Check out my earlier post called Kimolos: The Chalk Island. 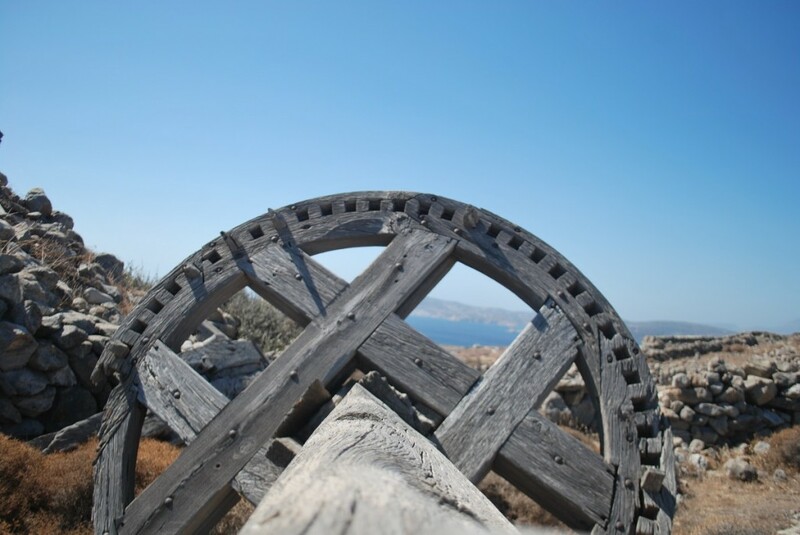 Have you ever visited any working or non-working windmills in Greece or around the world? wonderful work Marisa. I admire what you have done with the website design and your stories and pictures fantastic! Wow, thanks! That’s really kind of you and keeps me going 🙂 Hope to see you back here soon. Have a great summer.